NJB Article and Source Repository: Ice Age Europeans Had Some Serious Drama Going On, According to Their Genomes. By Sarah Kaplan. 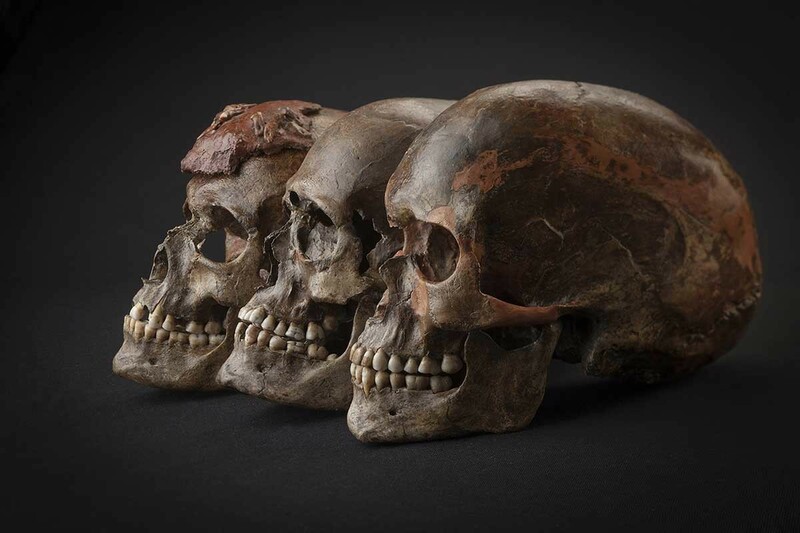 Ice Age Europeans Had Some Serious Drama Going On, According to Their Genomes. By Sarah Kaplan. Three ~31,000 years old skulls from Dolni Věstonice in the Czech Republic. For the next five thousand years, all samples analyzed in this study—whether from Belgium, the Czech Republic, Austria, or Italy—are closely related, reflecting a population expansion associated with the Gravettian archaeological culture. Credit: Martin Frouz and Jiří Svoboda. Ice Age Europeans had some serious drama going on, according to their genomes. By Sarah Kaplan. Washington Post, May 5, 2016. Game of bones: first Europeans’ shifting fortunes found in DNA. By Colin Barras. New Scientist, May 2, 2016. 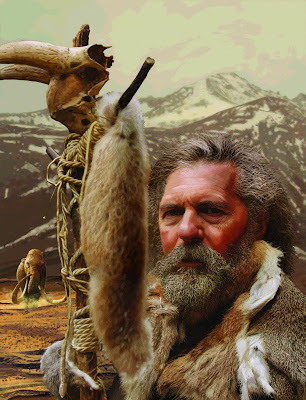 Genetic analysis of Ice Age Europeans. Phys.org, May 2, 2016. The genetic history of Ice Age Europe. By Qiaomei Fu et al. Nature, published online, May 2, 2016. Modern humans arrived in Europe ~45,000 years ago, but little is known about their genetic composition before the start of farming ~8,500 years ago. Here we analyse genome-wide data from 51 Eurasians from ~45,000–7,000 years ago. Over this time, the proportion of Neanderthal DNA decreased from 3–6% to around 2%, consistent with natural selection against Neanderthal variants in modern humans. Whereas there is no evidence of the earliest modern humans in Europe contributing to the genetic composition of present-day Europeans, all individuals between ~37,000 and ~14,000 years ago descended from a single founder population which forms part of the ancestry of present-day Europeans. An ~35,000-year-old individual from northwest Europe represents an early branch of this founder population which was then displaced across a broad region, before reappearing in southwest Europe at the height of the last Ice Age ~19,000 years ago. During the major warming period after ~14,000 years ago, a genetic component related to present-day Near Easterners became widespread in Europe. These results document how population turnover and migration have been recurring themes of European prehistory. The entire drama of human history is encoded in our DNA. Where we went. Who we slept with. How we died — or almost did. It's basically a scientific soap opera, complete with occasional discoveries of long-lost cousins we never knew we had. Take Ice Age Europe, for example. A new study of genetic material from the period reveals a continent roiling with change. First, an upstart band of modern humans arrived, slowly pushing their ancient predecessors out of existence. But soon that new lineage was swept aside by a group of big game hunters. For the next 15,000 years, the older community lay in wait in a remote corner of the continent before bursting back onto the scene. The usurpers were overturned, and history barreled forward. And all of this happened against a backdrop of dramatic environmental change — waves of cold and heat that sent glaciers surging back and forth across the continent. “The demographic history of early European populations was much more dynamic than previously thought,” Cosimo Posth, a PhD student in archaeogenetics at the University of Tübingen in Germany and a co-author of the study, told the New Scientist. Posth was just one of some six dozen researchers on four different continents who teamed up for the survey, which was published this week in Nature. The result of their efforts is the most comprehensive account of Europe's Ice Age population changes yet, and it's told entirely through ancient DNA. But before researchers could start analyzing that genetic material, they had to get it. DNA degrades over time, so extracting it from ancient human remains is difficult and costly. Much of that delicate work was done by Qiaomei Fu, the lead author of the paper and a genetics researcher at Harvard and the Chinese Academy of Sciences in Beijing. She had to make sure that each genome was uncontaminated by material picked up from microbes or present-day humans. Over and over again, she screened the samples, which came from long-buried remains spanning nearly 40,000 years of history. In the end, they had data from 51 individuals — a tenfold increase over the measly four that once gave researchers their only glimpses into this period. One of the oldest genomes studied came from a thigh bone discovered in Goyet Cave in Belgium and given the unwieldy name GoyetQ116-1. Radiocarbon dating pegs the Goyet individual at some 35,000 years old, making him a likely member of the Aurignacian culture. These stone toolmakers produced the oldest known example of human figurative art — a 40,000-year-old figurine called the “Venus of Hohle Fels” — as well as countless cave paintings. Goyet guy’s DNA is also strikingly similar to many modern Europeans’. Does this mean that his family were the final colonizers of the continent? Not quite. Around 1,000 years after the Goyet individual was found, a new culture swept through Europe: the Gravettians. Analysis of genetic material from the time shows that art and artifacts weren’t the only things changing. The Gravettians’ DNA was significantly different from their Aurignacian predecessors, suggesting that they were a completely separate lineage. Goyet guy’s descendants retreated to the Iberian Peninsula (modern day Spain and Portugal) and waited for their time to come again. It did, some 15,000 years later. Probably spurred by climate changes as glaciers began to recede, this dormant lineage expanded back into the rest of Europe, bearing a new culture known as Magdalenian. Not long after that, their genomes started to look like those of people from the Middle East and the Caucasus, suggesting that new arrivals from the southeast were mingling with — and in some cases supplanting — the existing population. and an author. Credit: Stefano Ricci. This was a surprise, because researchers used to think that transition happened much later, when Turkish farmers introduced agriculture to Europe some 8,500 years ago. “It is amazing how ancient DNA now starts to provide us with a detailed account of the earliest history of present-day Europeans,” Max Planck Institute anthropologist Svante Pääbo, another author of the study, said in a news release. But like any good soap opera, this one is about disaster as much as it’s about success. The genetic analysis allowed researchers to trace the inexorable decline of Neanderthal DNA, which was two to three times more prominent in early human genomes than it is in modern-day ones. This supports theories that early humans interbred with Neanderthals, but that their DNA was toxic to us and gradually weeded out by natural selection over the course of millennia. For those among us who still carry fractions of Neanderthal DNA, that process is probably still happening, Pääbo said. The drama isn't over yet.